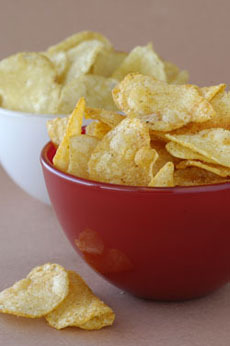 Potato chips, which were invented in Saratoga, New York, are more American than apple pie, which came here from Europe. Photo by Dhanraj Emanuel | THE NIBBLE. This is Page 1 of a five-page article on the history of potato chips. Click on the black links below to view the other pages. While much of history comprises many people doing singular things, in certain cases one or two people seem to do an awful lot. Some days, it seems that everything we enjoy was invented by the ancient Chinese and/or abetted by Thomas Jefferson. Thus, we have Thomas Jefferson perfecting ice cream recipes (originally created as fruit ice by the Chinese and then to gelato in Renaissance Florence), Jefferson returning from Europe with the first pasta machine (pasta, too, invented by the Chinese), and at the same time bringing the recipe for French fries, called “potatoes fried in the French manner.” (No Chinese influence here; the potato originated in Peru and was brought to Europe by the Spanish conquistadors). From that elegant dining room in Monticello in 1789, French-style fried potatoes spread quickly and far. The style of the time was a thick-cut fry and not the slender julienne frites of today. Enjoy the tale of how America’s favorite snack food came to be. 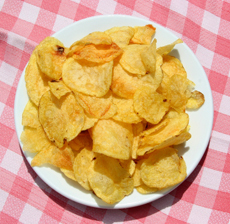 Photo of potato chips by Klikk | IST.